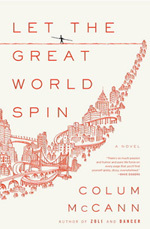 On Wednesday June 15th at a ceremony in Dublin, IAWA member Colum McCann received the 2011 International IMPAC DUBLIN Literary Award for his novel Let the Great World Spin. The International IMPAC Dublin Literary Award, administered by Dublin City Public Libraries, is the largest and most international prize of its kind. It involves libraries from all corners of the globe, and is open to books written in any language, which have had an English-language edition published in a designated period. An initiative of Dublin City Council, the Award is a partnership between Dublin City Council, the Municipal Government of Dublin City, and IMPAC, a productivity improvement company which operates in over 50 countries. McCann was born in Dublin but makes his home in New York City, where the prize-winning novel is set. Let the Great World Spin which won the National Book Award in America in 2009, was selected from a shortlist of 10 books. Let the Great World Spin is the critically acclaimed author’s most ambitious novel yet: a dazzlingly rich vision of the pain, loveliness, mystery, and promise of New York City in the 1970s. In the dawning light of a late-summer morning, the people of lower Manhattan stand hushed, staring up in disbelief at the Twin Towers. It is August 1974, and a mysterious tightrope walker is running, dancing, leaping between the towers, suspended a quarter mile above the ground. In the streets below, a slew of ordinary lives become extraordinary in bestselling novelist Colum McCann’s stunningly intricate portrait of a city and its people.